Every true follower of Jesus is a disciple and a disciple takes the great commission seriously to heart (Matthew 28:19-20). Our primary calling is to be reconciled with God and to become Christ’s ambassadors in the ministry of reconciliation (2 Corinthians 5:17-20). When we were saved, God began to transform us into the image of Christ to be His witnesses in His ‘search and rescue operations’ for the lost souls. He also put us under His ‘witness protection program’ from the spiritual warfare around us. If we are not sharing this fullness of life in Christ Jesus with others, then we are being unfair and unfaithful to God’s calling of us. We are also limiting God who is more than enough to meet all our needs according to His glorious riches in Christ Jesus to fulfill this mission. Our God is more than enough to fulfill His mission and provide for the vision with or without us. But He invites us to have the privilege to join Him so that we could experience the fullness of joy in His presence as He promised. God provides for us so we can accomplish what He entrusted us to do. This promise however, is only for those who are in Christ. People who are not in Christ live unhappy and discontented lives with unsatisfied desires because they love themselves too much and they care more about what they have and do not have. Sadly, some Christians also couldn’t commit to this mission God has for us due to their conflicting priorities for survival. We are not here merely to survive. We are here to accomplish a call. Knowing God allows us to be in AWE of Him, and will cause us to lead others to experience the same. God is waiting for you to ask. You do not have because you do not ask. Instead of asking, you worry. God instructed us not to worry but to make our requests known to Him (Philippians 4:6-7). If you always worry, you will always be poor even if you have lots of money. Worry is a warning light that you doubt the God of the How Much More. Ask, seek, knock = Ask. God listens. Keep on asking God. Tell God what’s in your heart through prayer. He invites us to come to His throne of grace with confidence in Jesus. It is not by our own power or righteousness that God answers our prayers. God put into our hearts the desire to ask because He wants us to receive so that our joy will be complete (John 16:24). Learn to be content in whatever circumstances (Philippians 4:11-12). God is more concerned with our character than with our comfort. We come here on earth with nothing; we will leave with nothing (1Timothy 6:6-7). The things that we have here on earth will stay here on earth. 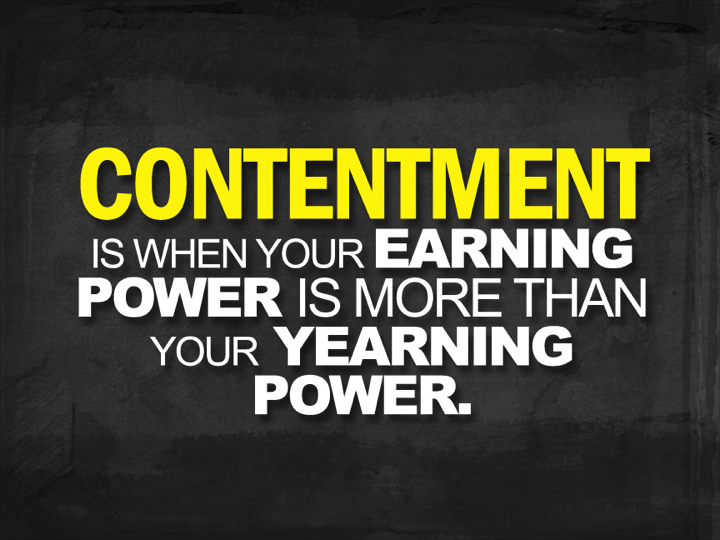 Contentment means your happiness is not dependent on your circumstances. Go and do what God is telling you to do and He will take care of you. 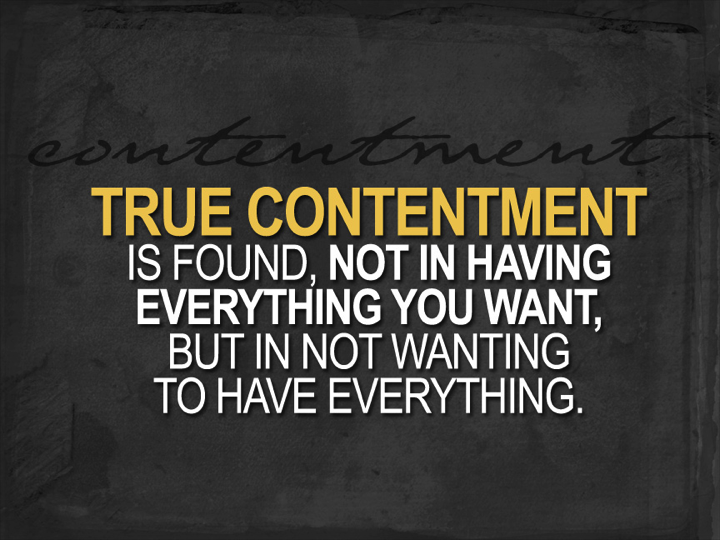 Contentment is not having what you like but liking what you have. 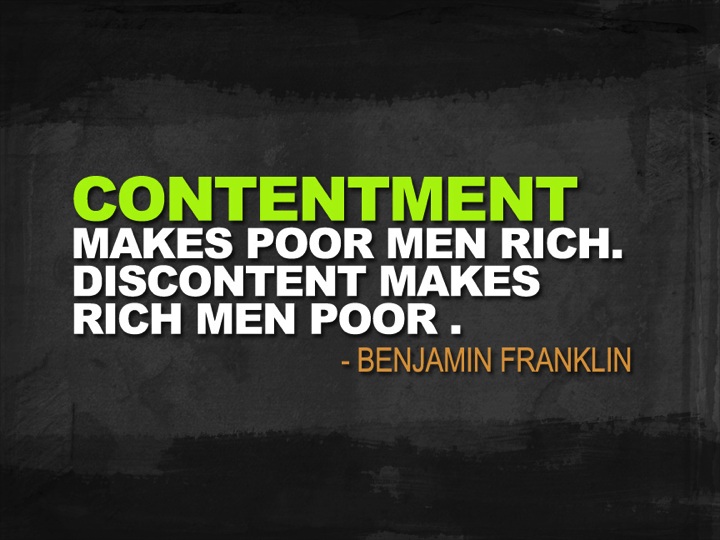 Contentment makes poor men rich. Discontent makes rich men poor. Comparing will affect your contentment. 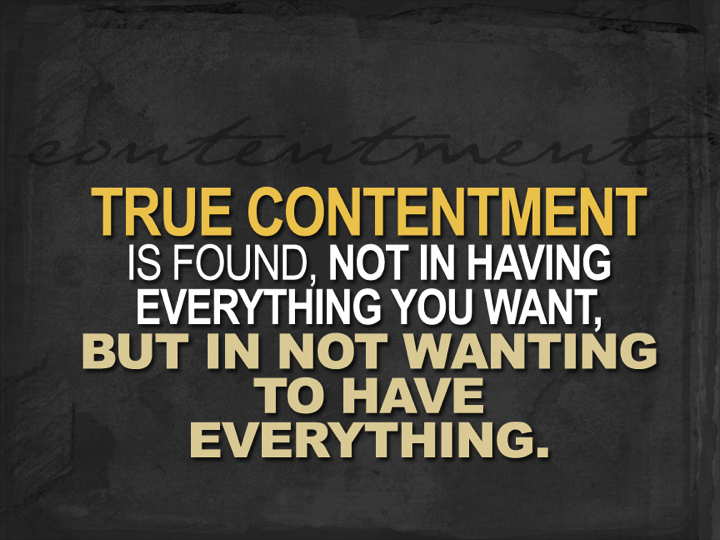 Contentment is not dependent on what you have, but on who has you. You belong to God and He will supply all your needs. Practice giving by faith. Your giving is your worship offering to the Lord. The way we handle money is a true indicator of the true condition of our hearts. Money is used as an acid test. Where your treasure is, there your heart will be also. 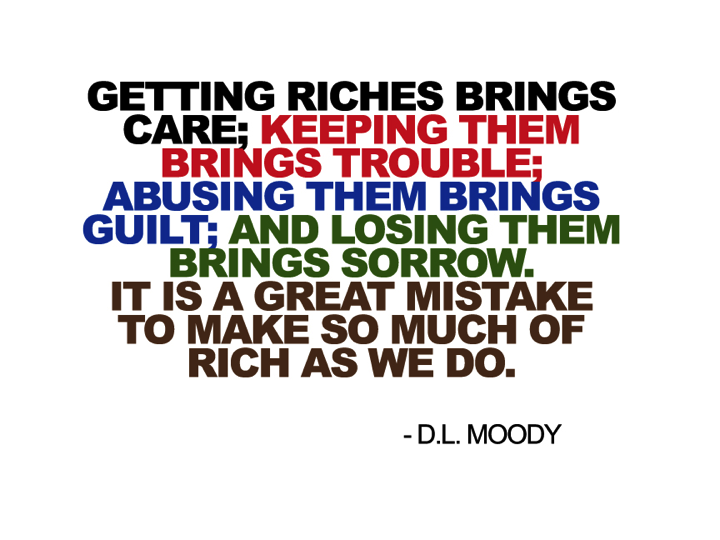 Principle: You reap what you sow (Galatians 6:7; 2 Corinthians 9:6). Get as many vessels to fill up with oil, for when there is no more empty vessel to fill, the supply of oil will stop (2 Kings 4: 1-7). Honor the Lord by giving Him the first part of your income and He will fill your barns (Proverbs 3:9-10). 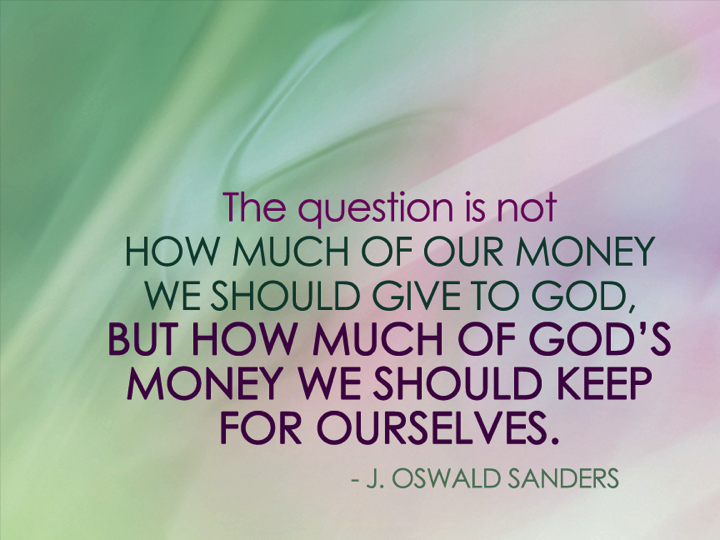 It is not how much of our money we should give to God but how much of God’s money we should keep for ourselves. If every Christian will tithe, the church will begin to make an impact as salt and light to the earth. Be faithful with what you have and receive. Be prayerful for what you need not your “greed”. Don’t trust your wealth, but trust God who owns your wealth. He provides so we can fulfill His mission for us to make disciples to honor Him.